My favorite thing about sending someone a pretty card is that (obviously) it can double as miniature art afterward. I would happily frame any one of these. And that little elephant has lots of cute animal friends right here. 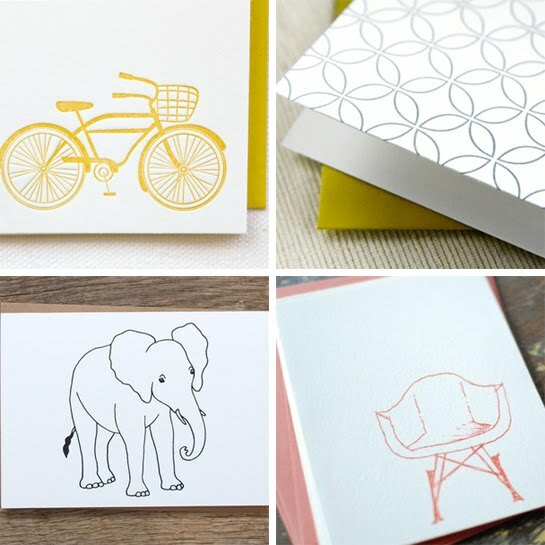 1. bicycle letterpress - paper lovely press. 2. covent garden letterpress - maida vale. 3. eames chair - paper and twine. The bike is so sweet as is the elephant! I always like to give cards that can be used after their intended purpose is done, they do make wonderful mini-art! I definitely have a bunch of framed greeting cards hanging around the apartment! the bike and elephant are super cute! A friend just sent me your blog. She said you were a fellow Ann Arbor dweller. My husband and I moved here two years ago. Are you at all involved in the craft scene here? I'm quite smitten with your blog! Love these cards!! Especially the cute, little elephant. i love the little pink eames. it would be so fun to get that in the mail! These are so great and you are so right (about cards like these being extra special/used as artwork). Thank you for sharing! i am totally in love with the yellow bicycle! so precious!